I'm hoping the book comes out in about 3 weeks. 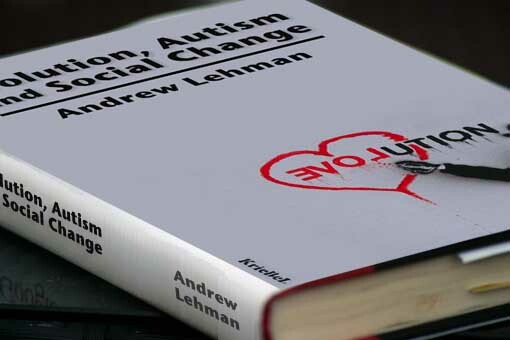 I’m just finishing this ~140-page work, Evolution, Autism and Social Change, which summarizes most of the principles I’m playing with. It skips all the political commentary that is scattered throughout this blog. The work also does not spend numerous pages exploring the presuppositions behind the principles of, and the presuppositional differences between, a maturational theory of evolution and the Neo-Darwinian survival-of-the-fittest frames focusing on mutation and adaptation. Explaining differences between evolution theories ended up requiring a need to explain integral differences between paradigms by detailing how theory is created. This felt like too much for a 100-page piece. I’ll save it for the larger work if I ever write it. A larger work would also describe a short history, most influential theorists and currently accepted theories in the disciplines being explored. Most of my writing falls within anthropology, neuropsychology and evolutionary biology. Still, I discuss primatology, psychology, consciousness, medicine and endocrinology. It is impossible in a short work to offer a several-discipline context. It’s even unwieldy in a longer work, particularly one that seeks to communicate with a lay audience. There is also the fact that though I am somewhat familiar with what I am talking about in anthropology, neuropsychology and evolutionary biology, I am woefully unqualified to provide much depth in the other disciplines I touch upon. Intimidated by what I am doing, I prefer to avoid behaving like I know what I am talking about in a discipline outside where that discipline touches upon my basic thesis. So, in Evolution, Autism and Social Change, I offer about ten pages where I review classic heterochronic theory, or the subdiscipline of evolutionary biology most integral to understanding what I am doing. I’m worried those ten pages may lose three-quarters of my readers. There are many philosophical implications to Evolution, Autism and Social Change. That also gets saved for a larger work. I estimated 17 sections of implications. That was way too much for what is essentially an introduction. The future implications of the theory also seemed too much information for a short work. Those ten threads were left for the larger work. One principle or concept has emerged since Evolution, Autism and Social Change went to the editor. The central thesis of my theorizing condensed to the following sentence about nine months ago: The Orchestral Theory of Evolution is the study of the rates and timing of maturation, with testosterone levels impacting rate and estrogen levels controlling timing, with those environmental or social structure adjustments that influence levels of testosterone and estrogen determining the speed, timing, features and direction of evolution. It feels lately like it has condensed even further. The word maturity now summarizes the central thesis. Whereas Darwin focused on conception and death with his theory of natural selection, which merged survival of the fittest with heritable traits, I find that the word “maturity” suggests all that which occurs between conception and demise that influences evolution. I’m not sure how to integrate this understanding with the work now with the editor. When I first wrote this stuff up in 1998 in the website serpentfd.org, estrogen’s connection with the dynamic was not at all clear or understood. It was all about testosterone. The model was expressed as a four-layered process unfolding in the push-and-pull way a serpent crawls. Though I understood that the timing of maturation was integral, I had no idea what informed timing. So I concentrated only on changes in rates of maturation. With what I’m finishing now, I feel a whole is communicated, even though much has been left out. Nevertheless, as someone who is not an academic–I am an artist by training–I am now left with the choice of how exactly the book is to be framed. I am concluding that it is more genuine and reasonable to make this a book with an artistic rather than an academic slant. Joining sections with illustrations seems right. It makes it more accessible. To pitch the work to fit academic conventions would probably be a waste of time. Academics don’t offer attention to the work of nonacademics in their field. It’s just off their radar. Academics don’t even often offer attention to multidisciplinary theories that include their discipline. They are used to regarding the work of those that have put in the time to get a degree in their particular discipline, those that have something to lose if they don’t perform. Maybe 30 years ago a book came out with many diagram-like illustrations describing the spiritual transformation that was going to occur as a result of several planets aligning in a certain way. The book was called Harmonic Convergence and was written by Jose Arguelles. Even though I’m writing a book on evolution grounded in conventional science, there is really no format precursor to this book I’m finishing. The closest thing that comes to mind is that weird astrology book. Bummer. Trying to find a publisher for what I’ve done seems a prescription to feel rejected. Though some well-known authors, scientists and theorists have said kind and/or respectful things to me in emails, or just asked questions (Simon Baron-Cohen, William Irwin Thompson, Elaine Morgan, Riane Eisler, Tom Robbins), none has gone so far as to offer firm support for what is clearly an unproven theory, though they have usually had encouraging things to say. I don’t think a publisher interprets encouragement as support. I will self-publish. I have several friends that have written books and found publishers. Just because a publishing company puts a work into print does not mean it promotes the work. So, I’ll publish this myself, if I bring it to print. I’ll begin by posting this as a free pdf download. April 1st is my target date. It will be difficult to categorize. I’ll mull over ways to promote it. How many books are out there purporting to explain autism from an evolutionary perspective using a new feminine theory of evolution, with illustrations?